How precise is Timbeter for accurate timber measurement? Very often we are continually asked – how precise is Timbeter? The most straightforward method for determining the accuracy would be to measure the pile of logs with Timbeter, and then measure manually a couple of logs for comparison. But if you don’t have any logs nearby, then how do you attain effective control of your measurements? I will begin by bringing some clarity on this hotly contested topic. It is important to note that Timbeter detects the contour area of a log under the bark and converts it to a symmetrical circle, from where the average diameter is calculated. For accurate diameter measurement, more than 2000 points per one log counter are detected. If the human is measuring the log then the typical method is to measure the log from the widest and the narrowest part and calculate the average of these two figures. In addition, there may be cases where the diameter is measured from the most narrow part (usually case when the measurement is done on the buyer side). So this is usually the explanation why the manually measured diameter and Timbeter results differ. Of course I must stress that different log conditions can have varying effects on the measurement results: poor loading quality, snow, muddy logs, logs hidden in grass. But every measurement can be checked and manually corrected by the user. Furthermore, all measurements can be re-measured within the app or on a PC or laptop. 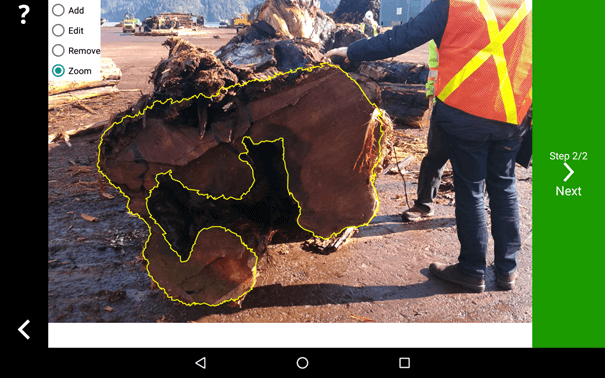 Every single measurement taken improves and enhances Timbeter’s machine-learning algorithm to ensure that Timbeter can detect even the muddiest logs, or those logs with poor loading quality. A unique challenge for us has been the detection of pulp-and fuelwood, where the logs diameter can be down to as low as 5 cm. Usually this material is only being “measured“ via manual eyesight, as the timber without bark and air in the load is being assessed. We are happy to bring some transparency to the area, as Timbeter quickly provides the number of logs, diameters and the pile density coefficient of the load. Currently we are improving the features: measurement of high-value single logs. The team’s goal is to determine the contour area precisely as possible to make the life of log-scalers even easier.